A bridge is a fixed dental restoration (a fixed dental prosthesis) used to replace a missing tooth (or several teeth) by joining an artificial tooth permanently to adjacent teeth or dental implants. Types of bridges may vary, depending upon how they are fabricated and the way they anchor to the adjacent teeth. Conventionally, bridges are made using the indirect method of restoration. 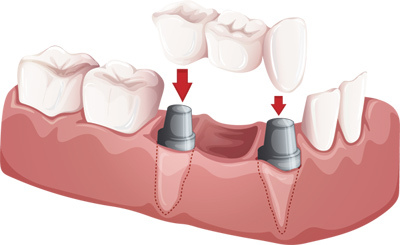 However, bridges can be fabricated directly in the mouth using such materials as composite resin.